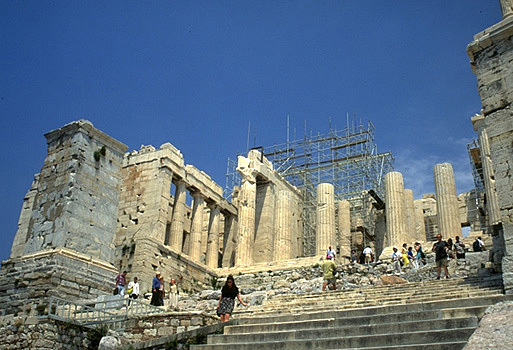 For years, tourists to the Acropolis have been frustrated to find ancient monuments shrouded in scaffolding, thanks to a long and painstaking restoration project. Now, an end is in sight. Greek cultural officials said Wednesday that work on the Parthenon, the Athena Nike temple and the massive Propylaea gate — treasures built in the mid-fifth century B.C. at the height of Athenian glory — should be finished by the end of next year. These three works will be finished at the end of 2006, said architect Haralambos Bouras, a senior project official. All three were vitally necessary, and failure to carry them out could have resulted in severe damage to the monuments. Still, more scaffolding could go up at the Parthenon — the biggest crowd-puller — as projects on the Acropolis hill are expected to continue until 2020. According to Maria Ioannidou, who is supervising work on all three buildings, the ongoing effort is the biggest restoration project currently under way in the world. The total estimated price tag is $84.4 million. We treat each piece like an individual work of art, Bouras said.